The views expressed here are those of the author, not of Dear JCPS. If you would like to respond, you are encouraged to submit a letter using our open letter form. I am in writing this email in support of Mr. Steed. My daughter [Name Withheld] was in the Louisville Best Hood group. I want to express the importance and relevance that this group has had on my child. I am so grateful she had the opportunity to learn real world content. I have heard some of the concerns around a lesson that taught the students of what they would do in an traumatic event around overdosing. I feel strongly saving one life is critical for our young people to learn. Many of our students live in an environment where overdosing is happening on a daily basis. To NOT have these conversations is detrimental to them and their families. In the past, students learned CPR, however in today’s times YES they need to learn how to save a life. We as a district should stop tip toeing around life and death issues. JCPS has for too long been ignoring the issues that affect black and brown communities and data proves this statement. Mr. Steed has been a pillar in many schools with addressing students needs. He should not be punished. His action were not malicious in any way. He should be commended for thinking out side of the box in addressing a societal issue which we all know spills into the classroom. Again I would appreciate your consideration of this email as a parent support letter as well as his colleague. As an educator I have been so excited to know that both of my daughters had him as a teacher. I would recommend any students I know to have him as a teacher. I can recall many students that had him speak highly of him. He is a teacher that develops relationships with all of his students. As anyone in education could state Building Relationship is key in student success and students feeling save and have a sense of belonging. Thank you for your time and attention in this matter. I wanted to check back in with you since it has been quite some time. I think you now see why I have been reluctant to divulge my name up until now. Here we are months later and Principal Mayes still sits at his desk at Manual running the show. It infuriates me every day that he has remained in this job, not on administrative leave, while this investigation takes place. 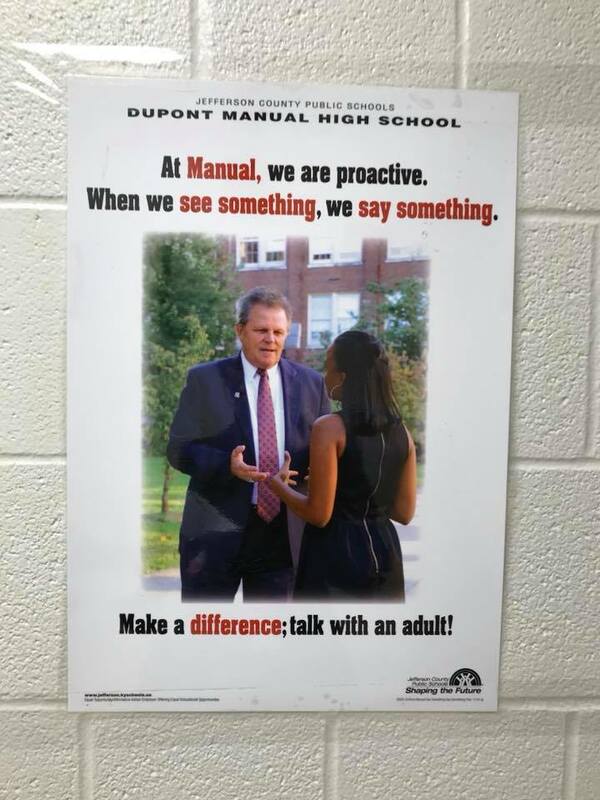 Manual parents, students and staff STILL REMAIN IN THE DARK about this supposed investigation into Mayes’ completely inappropriate behavior and conduct. No one from the district has ever reached out to us to give us any sense of what is going on. When you call the superintendent’s office no one will answer your questions and they give you the brush off. Everything is just as I expected — the district is silent just waiting this situation out and brushing everything under the rug. 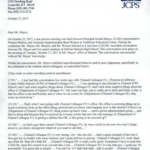 The posts to dear JCPS have ceased because we all know that the countless incidents of his vile behavior reported so far by students, alumni, staff and parents have not truly been paid attention to. Those of us brave enough to speak out (on behalf of countless others too fearful to do so) are disappointed and feel defeated that the district has not taken our concerns seriously. If they really cared for the students at Manual, they would have put Mayes on leave months ago. This wasn’t one allegation, it was countless ones. Alumni speak about his abuses going back years and years. How the district didn’t outright fire him over all of this is truly shocking, but the fact that he remains in charge at Manual is unconscionable. 1 – Why is Mr. Mayes still the principal? How is Mr. Mayes allowed to still be there as principal? We now know what he has said to students (as recent as 2017) alone with them in his office. We now see that students are too intimidated to speak out until they are graduated and gone. How is this acceptable? My child is now afraid to go to school. He’s not afraid of a schoolmate bully, but instead an ADULT one that sits in the principal’s chair. (child says)“If he has taken other kids out of class to talk to them, that could happen to any of us. It has happened to some kids I know at school, and they say it is scary and he throws his power around. One kid supposedly had to sign some paper about something he did. You can’t think straight if you think you might somehow be in trouble or convinced that you are in trouble when you really didn’t do anything. How do you really know what you are signing? If you get taken to the principal’s office, you are in trouble, right?” Friends at other schools are also asking my child what is going on at his school because his principal has been in the newspaper saying crazy things to students. This is supposed to be an environment of learning, yet it is not because the kids (and teachers he reports too) are so preoccupied with and distracted by the outrageous things the principal has done and said. We know Mr. Mayes has run down students (past and present), their heritage, teachers, administrators by name, JCPS district employees and more. How is any of this acceptable? JCPS, this is on you. We haven’t heard anything from you, but thankfully we have heard about it from the media. 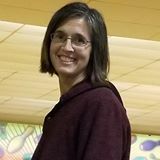 How many MORE people have to come forward with credible and specific incidents (all of which are establishing similar patterns of intimidation and bullying behavior) before something is done? I guess 2, 5, or even 7 accounts isn’t enough – there were 7 accounts in the newspaper on Sunday. How many more must there be? The Courier Journal has done their due diligence to interview these former students. JCPS, have you spoken to these students? As a Manual parent I have had ZERO communication from you, JCPS, as to what is going on here and what you are or aren’t doing about it. Dr. Pollio, if you really want this Superintendent’s job, you certainly aren’t acting like it. You aren’t being proactive and keeping us as Manual parents informed on this extremely important matter. It sure seems like the district is taking sides with administration instead of with students and their well being. Here is a quote from the newspaper article that drives this point home – “JCPS reprimanded Mayes last month for comments he made in the recorded conversation. 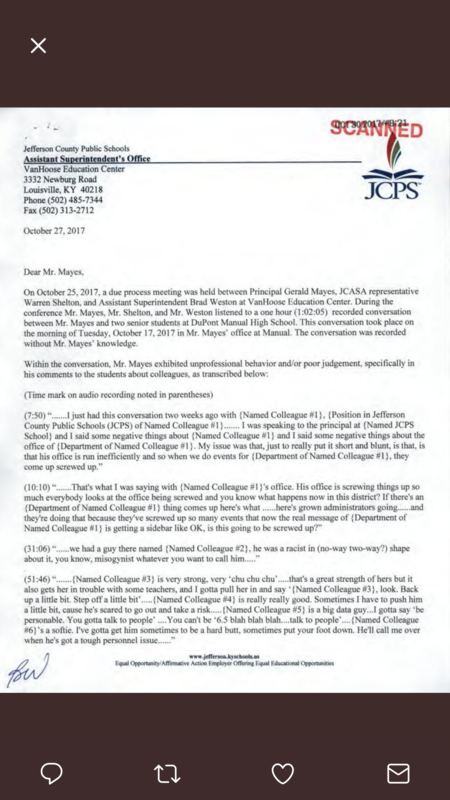 But, according to Oct. 27 reprimand letter obtained by Courier Journal, Mayes was chided for speaking negatively about fellow JCPS employees during the recording, not for his race-related comments.” Mayes didn’t get reprimanded for what he said, are you kidding me? This clearly shows that you favor the adult over the kids here, and that is a real travesty. We are still a relatively new family to Manual and I’m considering transferring my child out. I don’t want my child in the building with Mr. Mayes anymore. However, my child should not have to be the one to go, it should be the principal. 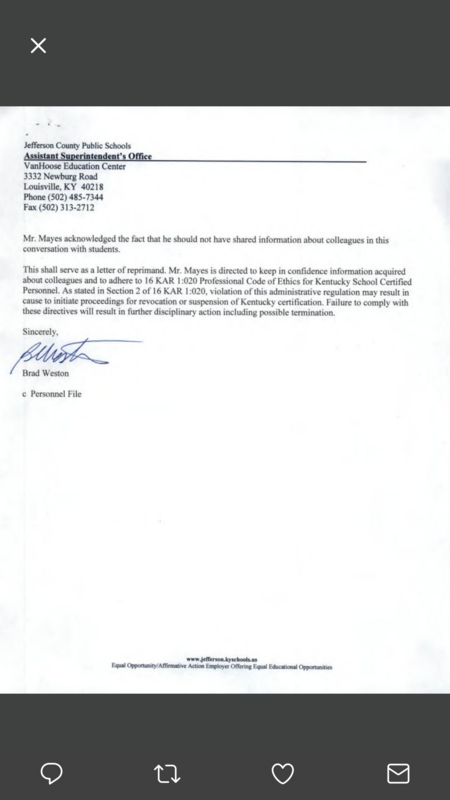 Based on his actions, Mayes is in no way fit for this job. Manual now needs a kind, honest and stable leader that focuses on the well-being of every single student. The days of intimidation and fear from the top down need to be over…immediately. 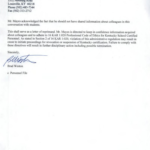 Note: The Courier Journal article regarding the reprimand has since been updated to reflect the true content of the reprimand letter. The views expressed here are those of the author. If you or someone you know has a concern regarding events taking place at Manual or another JCPS school, you are encouraged to submit a letter using our open letter form. While the name of the author has been withheld here, they are not anonymous to us. 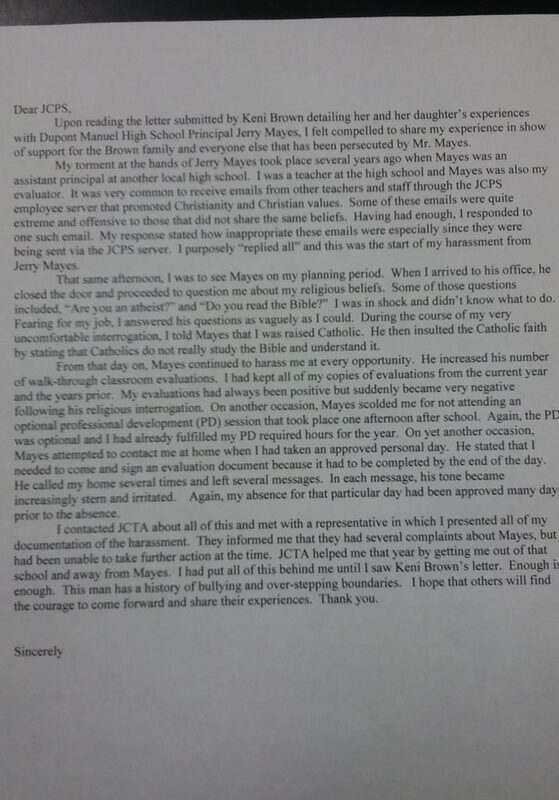 If a school board member would like to follow up on this complaint, they can contact us to make a connection with the author.